We want to get Married! Congratulations on your engagement! Couples planning to marry in the Archdiocese of Philadelphia must make arrangements with a priest at least six months before the wedding date. Dates and times are reserved on a ‘first-come, first-served’ basis, so we recommend you schedule the wedding more than six months in advance if possible. The first step is to call the Parish Office and make arrangements to meet with Father Robert McDermott, Pastor. He can be reached at 610-485-0441, ext. 3. In order to be married at Saint John Fisher Parish, at least one party must be a member of our parish. Both parties must be free to marry. If one party, even a non-Catholic, has been previously married and has not been widowed, a Catholic Church annulment is required to show freedom to marry again. Father McDermott can advise you about this process. 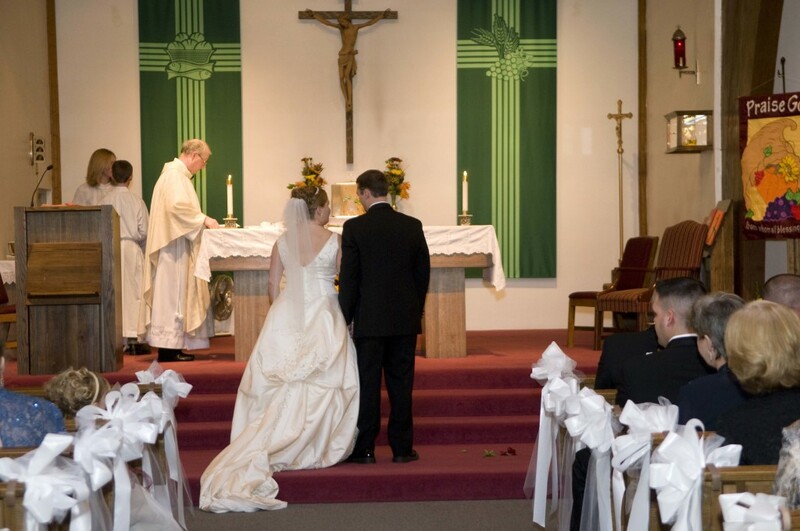 You may have a nuptial ceremony with or without a Mass. A Nuptial Mass is highly recommended when both parties are Catholic. However, when the spouses are of different Christian faiths, a ceremony without Mass may be more appropriate. All couples must attend a Marriage Preparation Program or a Pre-Cana Class approved by the Archdiocese of Philadelphia. Saint John Fisher does not offer its own Pre-Cana Program, but other local parishes do and you may attend theirs. The Archdiocese of Philadelphia also offers a program that you can attend. Click here for more information. Weddings may be scheduled on Friday evenings or on Saturdays. We currently celebrate wedding Masses at Saint John Fisher or at Immaculate Conception of Lourdes Church, our worship site in Marcus Hook. We look forward to celebrating the Sacrament of Matrimony with you!